My poetry has appeared in small presses such as AMBER, Pegasus, Snake River Reflections, and The Blind Man's Rainbow. My work has also appeared in Isotope: A Journal of Literary Nature and Science Writing from Utah State University and The Hong Kong Review. I've studied poetry with Carl Phillips and Solmaz Sharif at The Kenyon Review Writers Workshop, Katie Ford at the Iowa Summer Writing Festival and with Kim Addonizio. Some of my past work can be found here. Got word today from Kenyon Review legend Nancy Zafris that she was going to take one of my poems for The Hong Kong Review, the inaugural issue of which she will be the Editor. The poem was inspired this past summer at the Kenyon Review Writers Workshop during a viewing of the short film, Paul’s Case, based on the short story of the same name by Willa Cather. Cather’s story is about longing for a world that’s aspired to, yet intangibly out of reach, where a high society life can be a temporary placeholder for belonging, but if lacking authenticity (or the societal acceptance of you being authentic), then one’s own life may not even be enough to redeem for acceptance. Honored by the chance to be a part of a new publication and grateful to Nancy, Kenyon Review and the Hong Kong Review for being allowed inside its first pages. From Szymborska’s acceptance speech for the 1996 Nobel Prize for Literature, she calls out what I myself, and other poets I’m sure, have been sensing since we first started putting verse to paper. I think there’s always a bit of self inflicted imposter syndrome when it comes to poets and writing poetry. There is no public certification, no licensing exam to pass to “become” a poet. Words inked on paper or typed across a computer screen, or simply just speaking into a mic, are really the only qualifiers and even then, at best, are only subjectively good or bad. Szymborska says, “Contemporary poets are skeptical and suspicious even, or perhaps especially, about themselves. They publicly confess to being poets only reluctantly, as if they were a little ashamed of it.” Because as poets we’re less terrified if someone doesn’t take us seriously when we say, “I’m a poet” than we are when someone does take us seriously. Okay. Now what do I do? Saying “I’m a writer,” can mean a host of things that connect the act of writing down words to the act of paying bills. But the National Endowment for the Arts in 2018 does reassure us that poetry is making a comeback. I’m hopeful that along with this resurgence will be an embrace of poetry not just as an art form, but as an act of declaration, documentary, response. that the poet get out of the way. in order to fill itself up. that it has vanished forever. A week before the 37th Annual Northern California Book Awards I had the chance to see National Book Award Finalist Kim Addonizio join 2018 NCBA Poetry Nominee Brittany Perham, and Pushcart Prize winner Donna Masini for a reading at East Bay Books in Oakland. Kim's memoir Bukowski in a Sundress had been my guide to the writing life when I attended my first poetry workshop a couple of years ago at the University of Iowa. Her advice to take your work much more seriously than you take yourself was an important compass point for me in navigating the wider "poetry biz" or "pobiz" landscape, egos and art and community in all. Incredibly, I was granted the chance to return again to Gambier for another summer of writing with a close-knit, talented cohort of writers for a week of reading, writing, supporting, celebrating. 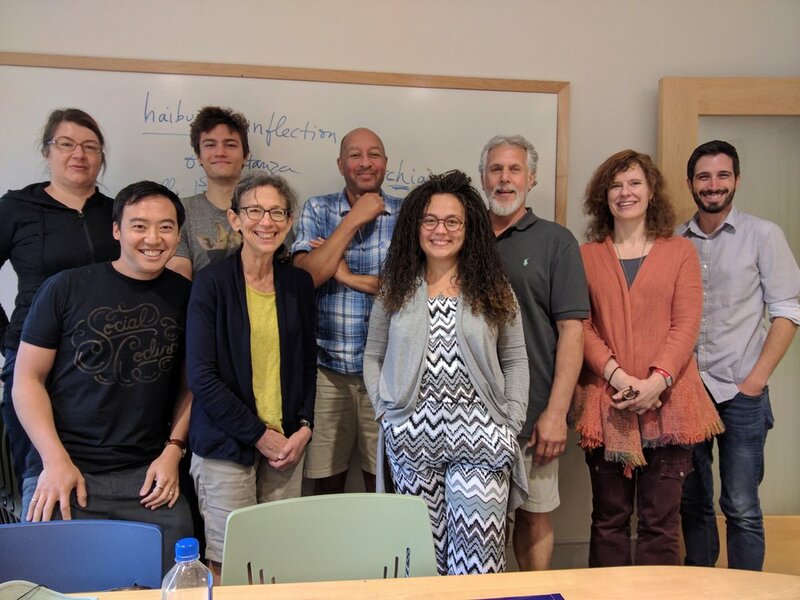 Perhaps even more incredible was the chance to study with National Book Award Finalist Solmaz Sharif, with Nathan Lipps as our Kenyon Review Writers Workshop Fellow. Getting "encouraged" to do an pop-up reading in the company of fiction, creative non fiction writers and poets outside the VI on a humid Gambier summer evening (thanks Elizabeth Dark and Stacy Murison!). Impromptu writer moments surrounded by scary talented, praised, award-winning creatives like this are what make the community of KRWW so special, year after year, each cohort connected to the community of each other and to the instructors & students of years prior. Closing down the VI on the next to last night of the week. (L to R): Joel, Caroline, Rachel in front of Caroline, Jabari, Cristi and Sarah sharing life stories, poets and writers we're inspired by and eating lots of tater tots. The famous Middle Path, which connects the original Kenyon College buildings to the rest of campus, through the town of Gambier and to the dorms. During the day, there are writers alongside the grass, sprawled in Adirondack chairs, typing on laptops across the benches. During the night, you're alone with your thoughts (and your writing prompts that you haven't finished yet). Not sure what about seeing this well read volume of T.S. Eliot sitting on a shelf next to antique pasta machines made for such a pleasant discovery. It was a sunny weekend at the start of vacation on a hilly side street in Seattle. Waiting in line, I saw fragments extruded through the air in so many letters of semolina. Late night revisions have been the only way to work poetry into the holiday schedules, long weekends and days off: endless feasts, family time, errand running & celebratory gatherings. I had a huge privilege to be admitted as part of a community of eighty poets, fiction and creative non-fiction writers for the 2017 Kenyon Review Writers Workshop. I studied there with Carl Phillips and together with a high caliber class, we spent ten intense days isolated on a grassy hill an hour north of Columbus, Ohio. Past Workshop attendee Molia Dumbleton's blog was all I needed to be convinced to apply for this summer's session and item by item, all eight of her observations became obvious as I worked through my time in Gambier. The strong writers surrounding me formed a truly stunning group, their passion for writing and engaging as a community outshining their already impressive accolades, publications and academic fellowships. The generative aspect of the Workshop was what made the place so special. Alongside writers that also care deeply about the craft of writing, you are all creating new work from scratch together, experiencing the styles and approaches that have made each of you successful in your own ways. Then your work is critiqued in workshop by a jury of your peers. Your conversations over a coffee or pint of beer aren't just, "What are you reading?" but "What is it about what you're reading that you think makes it such an impactful piece of writing?" // Can't Stop Won't Stop - To echo Molia's blog above: the week is nonstop, overwhelmingly generative. You extract new work through guidance, prompts and critiques throughout the entire week. It's simultaneously exhausting and rewarding by day ten. // Nowhere to Hide - Due to a combination of Kenyon College being quite removed from anything other than you, your pen, and your laptop, you will be writing on a hill in the Ohio countryside designed to keep you writing. All excuses, procrastination and distractions are removed (not sure to curse or praise John Legere and TMobile for my not having even a pixel of signal in Gambier). If you need some physical relief, there's the shining Kenyon Athletic Center, full scale indoor and outdoor tracks, tennis courts and gym, otherwise, an idle pen becomes a restless one. // Kenyon Moments - Whether you're standing in line for a cafe au lait and Better Morning Muffin at Wiggin Street Coffee, stopping along the Middle Path to chat with a fellow writer who's in between thoughts while sprawled in an Adirondack chair, or meeting up for drinks and quesadillas at the VI , you will create a hundred mini, interstitial conferences between yourself and your fellow writers from across all genres, sharing ideas and urging each other onwards. And each night when you gather in front of the entire workshop for readings, it's all at once inspirational, revelatory, celebratory. What's Life Like in the "Poetry Business?" Here's link to an NPR podcast on precisely that: the pobiz. Portugal scored the winning goal in the 2016 Euro Cup and the room filled with fist pumps and clapping. The surreal part of that whole moment was that it took place in a Iowa City shopping mall over food court Chinese takeout. The big screen television in the center of the seating area was surrounded by clamshell fast food boxes and orange plastic trays. I tried not to get hot sauce on my notebook. I had just finished my first Iowa Summer Writing Festival, studying poetry over a weekend in July and drifting through the hallowed campus trails where the Iowa Writer's Workshop took shape nearly 80 years ago and was reflecting on the last couple of days. I knew I was in the only UNESCO City of Literature in the US when even the local hotel and convention center had an elegant library dedicated to Iowa Writers, including an entire shelf of Pulitzer winners with ties to the Workshop. I also learned that Jorie Graham is everywhere, inside Prairie Lights Books, quoted on posters and sidewalks, making appearances on sculptures hidden in wildlife preserves. That would explain some of the high energy intensity I felt when I heard her read at the 92nd Street Y in New York a few years ago, radiating through time, space and library shelving. So in Iowa City, I studied with Katie Ford and seven inspiring classmates by day. And by night, to stay grounded, I had singles of Iowa-local Cedar Ridge bourbon alongside poet Kim Addonizio's new memoir about the pobiz. "When we talk about the writing life, " Addonizio says, "we don't just mean getting words onto the page; we also mean those times we desperately want to write, but can't." All surreal enough to startle me back into writing with full momentum. The continued themes I hear from poets on poetics is being able to understand the difference between poetry whose ends are just to be different from those that are authentically innovative. "I find too many first- and second-book poets to be afflicted with a kind of kneejerk irony, a similarly Pavlovian desire for disruption for no particular reason, and an obliquity that seems merely self-protective." I think that some of that "self-protective"-ness comes from a desire to create something new, to create something different from the rest of the pack. But differentiation for the sake of differentiation can have the opposite effect. Poetry as a whole may be having difficulties retaining even regular readers of poetry, but does that just become a marketing issue? Is the readership existing poets or attracting new readers to poetry or new poets of a particular style bent to some other particular bent? Broaden the circle of poets and poetic styles that attract you. I like that. I remember an interview with artist Neil Jenney where his advice to artists wasn't to exhaustively read Van Gogh's letters to Theo or anything, but to just look at art. To make good art you have to look at other art, even art that you don't necessarily like, as long as you can lucidly characterize why you don't (or do!) like it. That understanding of your personal tastes of good art vs. bad art leads towards your own growth. Poetry is the same way -- the wider your "discourse radius" the more exposure you will have to the broader world of writing that's out there. But Wojahn also extends his reading and collection of information beyond poetry to the wider scope of information itself. Somewhere in there is a source of more poetry. "...I use the notebooks mostly as a kind of commonplace book...I tend to read more history, nonfiction, science, biography and various oddball stuff than I read poetry, and the purpose of doing this is sometimes merely to preserve special and eccentric facts that intrigue me." And to share advice that he himself received. Better is better.
" 'Don’t worry so much about your poems—eventually they’ll get better.' This wasn’t exactly profound advice, but somehow it buoyed me. It reminded me that if you put the proper degree of time and effort into your craft, and keep doing it consistently, the odds are that you will get better. " "As Auden says, more poets fail from lack of character than from lack of talent. I like to remind my students that if they do the work they need to do, the odds are that in ten years’ time your poetry will improve; in twenty years, it will improve even more...It’s not all over by the time you reach thirty in the way that it is for Olympic athletes." So stick with it, keep revising the work. The most disruptive way to shake-up your craft is to let it grow, steadily, letting it shape itself. But it can't do that alone. You need to be there doing the hard work in guiding it, letting it mature, removing the precipitate, reblending it again. And then you just might be able to raise your glass. To check out the entire September 2015 interview, visit Kenyon Review here. "The truth is, nobody's waiting for you to press your poetry into their hands." But reading and writing and publishing poetry sharpens the nimbleness of your creativity, teaches you to temper the tough times and to hold onto your true grit. It's this continuous improvement and ongoing crafting that keeps me writing. Dr. Pamela Childers - Passionate author, educator and advocate of incorporating writing across the curriculum. Kemmer Anderson - Philosopher Poet with the wet sand of Patmos Island still in his sandals. And it is thanks to their continued support over the years that I have been able to maintain some sense of creative momentum. It's important to be innovative in the craft, but as a poet I follow literary critic Adam Kirsch's advice as closely as I can and leave the funny business at home, trying hard not to confuse novelty with new-ness.